Edwards nXDS10iC 7.5CFM Vacuum Pump - Save $1387 Free Shipping! The Edwards nXDSiC pumps are specifically designed for vacuum outgassing of material that is aggressive, acidic, or corrosive. The “C” designation means that this chemically resistant pump is fitted with Chemraz® internal valves and stainless steel fittings. Ideal vacuum 7.5 cfm vacuum pump for 5 cubic ft to 10 cubic ft vacuum ovens. 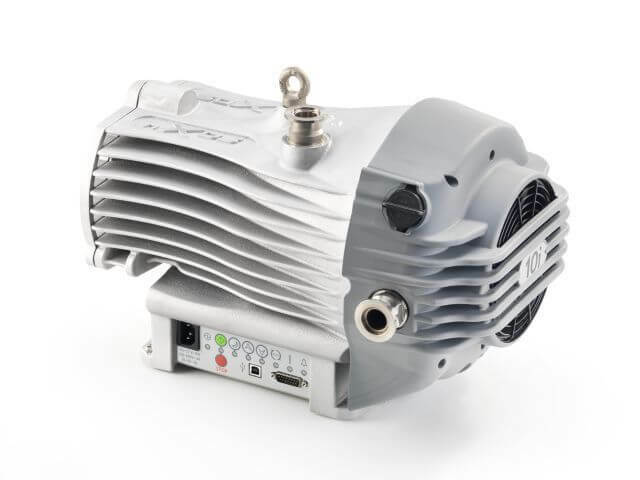 For maximum benefit, we recommend connecting this vacuum pump with our KF-25 MAX EVAP connection kit. Traps help prolong the life of your pump. Vacuum pumps ingest all the outgassing material (solvents, water, etc.) Over time and without routine maintenance, the vacuum pump will lose efficiency. Traps can help isolate outgassed material you want to reclaim. But keep in mind, a trap will trap a mix of everything, the stuff you want to keep and the stuff you want to dispose of. Want Faster Evaporation, Purging or Drying?